Although some businesses are increasingly focusing their marketing on social media and PR, search engine optimisation remains an essential strategy for leading brands; ensuring that they can be discovered by potential customers researching products or services using Google. It’s been estimated that there are 3.5 billion Google searches made every single day which offers a significant opportunity to get your business seen by consumers. Consumers use different search queries at different stages of their buying journey. However, if you don’t understand the queries and keywords they are using, and if your website isn’t shown in the Google results, chances are that you’ll lose potential business to competitors that have an SEO strategy in place. If you’re looking to boost your business’ ranking performance, gain leads, enquires and sales through your website – it is always best to employ a UK-based SEO company. 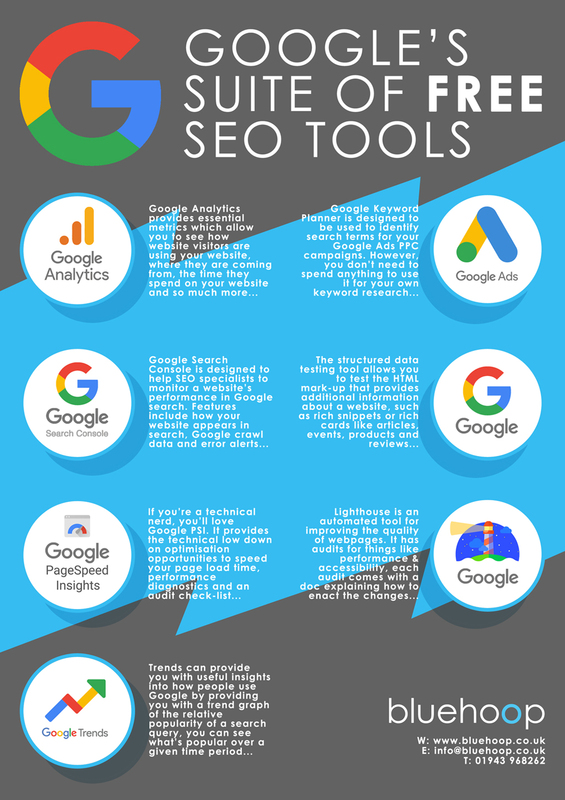 On the other hand, not every business has the spare budget to spend on optimisation services, that’s why the team at Bluehoop Digital share 16 free SEO tools, designed to help you understand where you need to focus your efforts. A good starting point for any SEO campaign is to gain a summary overview on the SEO health of your website. The audit tool makes use of the SEMRush API to provide a high-level technical SEO overview of how your website is performing, whilst highlighting the top issues that once addressed, can help to benefit your website’s SEO. In addition to the information on the top issues, your website will be given a score out of 100, where the higher the score the better. As a rule of thumb, where your website over-all score is less than 80 you might find it useful to speak to a SEO specialist for practical advice and recommendations. What makes this particular SEO audit stand out from the crowd is that the technical and SEO experts at Bluehoop also carry out their own manual checks (we are real UK-based SEO experts with real eyes looking for missed SEO opportunities). The Bluehoop team will supply you with information on actionable improvements you can make to your website to get it ranking higher in the search engines. Google are increasingly focused upon ranking fast websites higher in SERPS than slower ones. If you’re a technical nerd, you’ll love Google PageSpeed Insights. It’s the go-to tool for understanding the technical ins-and-outs of why Google thinks your website is fast or slow. Recently updated, it provides the technical low-down on optimisation opportunities to speed your page load time, performance diagnostics for your website and an audit check-list which is like a ‘pass list’. 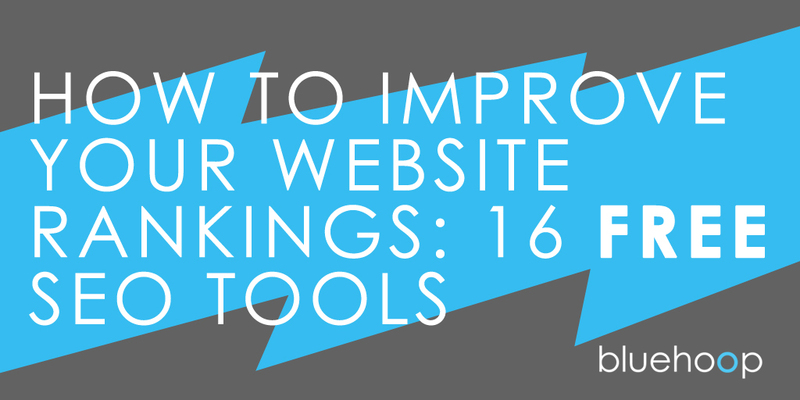 Along with SEMRush, MOZ are amongst the market leaders in providing tools and insights for optimising your website. Their local listing score tool provides you with an insight into the completeness and the consistency of your local business profile so you know what to add and what to correct. 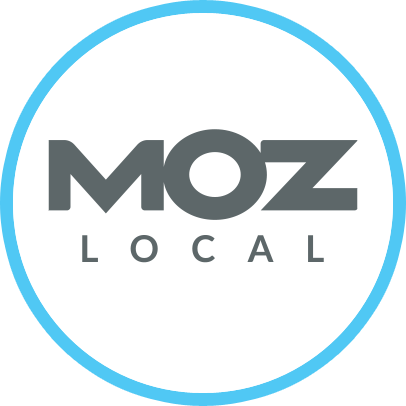 Please note: at the time of writing MOZ have temporarily paused new listings in the UK – so if you don’t get a result for your business, don’t panic. Understanding how potential customers research your products or services is essential if you are to grow your customer base. Keyword research is at the centre of gaining this understanding and is a crucial element of any SEO strategy. When we are researching for ideas, search queries or keywords for businesses we are working with, we often reach for this tool to help us get started. 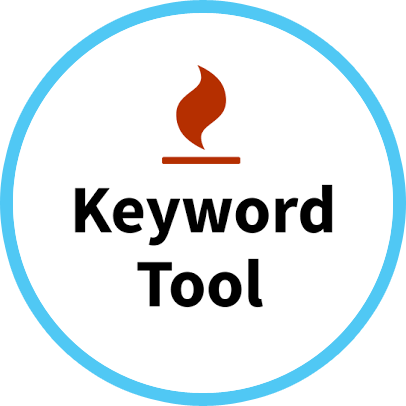 Keywordtool.io lets you research the sorts of queries related to your ‘seed’ keyword. It’s well accepted that if you can’t measure it, you can’t improve it. Google Analytics provides essential metrics which allow you to see how website visitors are using your website, where they are coming from, the time they spend on your website and so much more. The metrics that tend to be most interesting for planning SEO strategies (as well as other digital marketing strategies) are acquisition channels (See Acquisition > All Traffic > Channels). Here you will see your traffic sources segmented by different channels. If you would like to delve a little deeper and want to measure the quality of your SEO traffic take a look at the Assisted Conversions report (Conversions > Multi-Channel Funnels > Assisted Conversions). If you set a date range to ‘last month’ and then compare it to the ‘Previous period’ you will see a month to month comparison of website conversions from a search. Remember that with this report, if someone found your website initially through Organic Search and then returned later and converted, they won’t show in the Organic Search stats. Use this report to look for improvements in conversions resulting from your digital marketing efforts. For digital marketing people with a love of statistics, the insights that are available from Google Analytics can easily absorb you hour after hour! If you don’t use Google Analytics on your website, why not add it now and have a play? 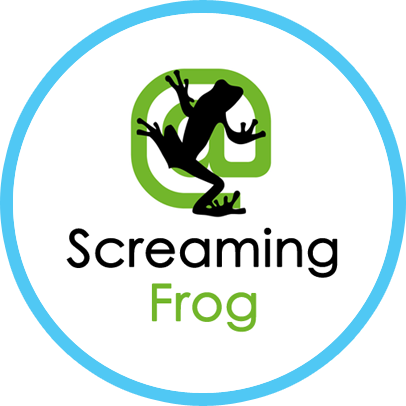 Screaming Frog is a great SEO tool. Their free version offers lots of insights, allowing you to see H1 and H2 tags, Alt Tags and Meta Descriptions. This downloadable software works by crawling your website’s URLs to fetch the key elements of the pages so you can make informed decisions about your SEO. Whilst the free version restricts the number of pages that can be analysed, it still provides data about page titles, meta data and helps you to discover duplicate content (duplicate content is not great for SEO). Another essential tool from Google. Google Search Console is a collection of resources designed to help digital marketers and SEO specialists to monitor a website’s performance in the Google search index. Highlight features include information about how your website appears in search, Google crawl data, and error alerts which might affect Google’s ability to include pages in it’s search results. If your website makes use of Structured Data, such as products or events, Google Search Console can be used to check that these elements are being indexed correctly. Delve a little deeper into Search Console and you can start looking for new search opportunities by finding keywords with lots of impressions but a low click through rate. You can then start work on improving your search engine presence for these search terms so that more people visit your website. Google suggest that backlinks to your website carry less weighting in their ranking algorithm than in the past. However, we still see lots of evidence of improved search engine rankings as a result of obtaining a backlink from an authority website. If you want to get a quick overview of the backlink profile for your website, AHREFS’ Backlink Checker can do this in a matter of seconds. This is one for serious keyword research! Google Keyword Planner is designed to be used to identify search terms / keywords to include in your Google Ads PPC campaigns. However, you don’t need to spend a penny to use it for your own keyword research – you just need a Google account. When you first access Google Ads (formally known as Google Adwords) you’ll be asked to set up an Ad campaign and they’ll keep asking you this again and again. So, once you’ve created an account click here: https://ads.google.com/intl/en_uk/home/tools/keyword-planner/ to access the planner directly. You’ll then have two options: ‘Find new keywords’ or ‘Generate search volumes and forecasts’. Google hates duplicate content to the extent that if your website’s text has been used elsewhere, they’re likely to rank your page so low in the search results that it has no ranking value whatsoever. Unicheck’s free plagiarism checker let’s you check sections of your website text to see whether it’s been used elsewhere before. If the check finds duplicate content on other websites, you’ll know that either your website content isn’t original or it’s been ‘borrowed’ by someone else. Google Trends can provide marketing teams with useful insights into how people use the Google search engine. By providing you with a trend graph of the relative popularity of a search query, you can see what’s popular (or not so popular) over a particular time period. Take searches for “wood burning stove” and Google Trends will show you that over the period of 12 months, the months where there is most interest in this search query are November and January. Armed with this information, it’s important to plan ahead to achieve high rankings for these time periods (and maybe to also co-ordinate any paid ad campaigns for these time periods too). Lighthouse is an automated tool for improving the quality of webpages. It has audits for performance, accessibility, progressive web apps and more. Each audit comes with a reference doc explaining why the audit is important as well as how to fix it. XML sitemaps are submitted to Google and other search engines to help them to crawl (and index) your website better. Your XML site map file will inform Google about all of the pages that make-up your website, which have recently changed and how to crawl accordingly. 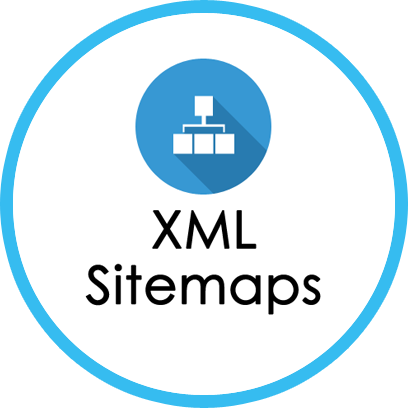 The free tool on the XML-Sitemaps.com website will allow you create a sitemap file with up to 500 pages which is ample for the majority of websites. A brilliant free tool that lets you view any webpage from the view of SEO (so without the styles or images). Perfect for quickly seeing the word count, internal and external link count, information about meta data, micro-data and schema. Quickly see who is linking to your competitors’ websites using Link Miner. This useful tool let’s you view which websites are linking, the type of link (do-follow or no-follow) and if the website is from a blog site. The free version is limited to checking just 100 backlinks each day. Another one from Google, structured data refers to the HTML mark-up that is used to provide additional information about a website. 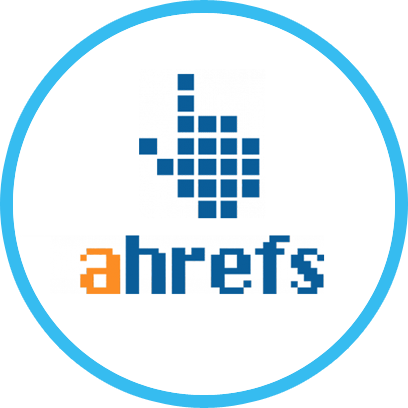 This can include rich snippets or rich cards including articles, events, products and product reviews. When used correctly, the mark-up allows Google to include rich snippets in the search results. In addition, if your website uses AMP and social cards there should be structured data included in the code behind your website.